Discover, explore, and settle Catan anywhere and anytime! ...even all by yourself! The Catan Dice Game is the perfect portable adventure experience. Play it in only 15-30 minutes! It's a great casual introduction to the world of Catan. With 6 colourful, embossed dice and your scoring map, you can roll - and risk - your way to victory. So get ready to toss! Challenge the odds and discover a fresh way to master Catan! 1 pad of colourful, double-sided Catan Catan maps with score tracks , so you can play two different games. 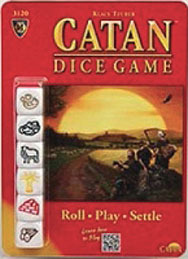 ...All you need for a quick Catan adventure on-the-go! This looks like a very simple dice game, but is actually quite involving and absorbing. Roll the dice and try to get the components needed to acquire roads, knights, towns and cities. After your first roll figure out if you can get any of the utilities you need and are in a location to get, or put aside any of use and roll again. You have three rolls to achieve what you need. Do you play it safe and stick with what you have or take a chance in order to try and score more? It is a fairly quick game for one player or more; four officially, but really as many as you can fit around the table.